KJo did some lateral thinking with help of some psychedelic drugs to come up with a plot like this. It is even more convoluted than magic quadrant flyover on Mekhri Circle, Bangalore. On this topsy-turvy journey you would often find turns where you'll feel pukish or sleepy. So, please keep that air sickness bag (which you stole from Indigo Airlines) and some cold water handy. After KANK, he has surpassed his own record with this K(AL)ANK. One of the best advantages of such a plot is that no body can accuse you of plagiarism. This plot is so "down to earth" that any normal homo sapiens with IQ above 100 wont get it. You need to come to KJo's lowly level of IQ 40-50 to get the crux of it. It is an abstract art which most sane people won't get it and that's why Ranbir Kapoor and Anushka Sharma fell for it. It challenges their ability to act natural and classy. Fawad Khan smelled something fishy-porky-beefy in this magnanimous love saga. So, he staged a big Geo-Political drama to got all his scenes chopped. Except the scenes where he is laughing unabashedly. Don't know why he felt that he'll still have the last laugh. Aishwarya Rai pleaded KJo for a simple 20 min slot with a linear story line. Her entire life and career has been a roller coaster ride and she didn't want any more profound experiments. It must have pained KJo but merciful he granted her wish. Just imagine you are watching Big Boss (I know its difficult but still). There are these 2 useless characters who are Bollywood Encyclopedia. They love discussing irrelevant uninteresting Bollywood trivia through out out the day. They are the master of cliches and don't miss a chance to hurl those cliches at each other. With their sick mentality, they dig some shameful moments of Bollywood for e.g. "Tohfa Tohfa Tohfaaaaa" and song from Maksad "Oye Oye Oye Garmi hai kahan" and enjoy discussing them. Even the artists who had performed these disgraceful acts have forgotten them and moved ahead. 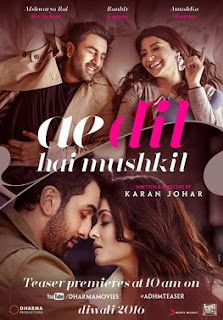 What if I say, those 2 utter useless senseless jerks are lead pair of Ae Dil Hai Mushkil. They derive such sadistic pleasure from these sub-standard moments of Bollywood that they become inseparable and fall in love. "Kayanat ki koi shakti unhe alag nahi kar sakti". Unless that #Shakti_the_Power is carrying some rare OST of Sufi music and best quality weed from Kasauli. Whammm.. Jerk #2 falls for it and breaks up from Jerk #1. Jerk #1 becomes a master storyteller and get hold of #Babe_da_hot. #Babe_da_hot has everything any man can desire but stills falls for Jerk #1 coz she is insomniac and Jerk #1 can make her doze off in a split second. It is later revealed that #Babe_the_hot is a witch from Hogwarts and takes Jerk#1 there. There they meet #Dude_the_cool, who engages in a duel with #Babe_da_hot with toughest rarest Urdu spells. Jerk #1 being a muggle doesn't get any wind of it. With time Jerk#1 gets smarter and unable to bore #Babe_da_hot to death and she dumps him too. By then Jerk #2 has also dumped #Shakti_da_power as he ran out of weed and his music collection is widely available on torrent. To avail her LTA, she makes a trip to Tirupathi and comes back learned. She realizes that its not love, it was a mere attraction. Real love is platonic love which is also called as fraandship. Thats why in Bollywood, most of couple say we are just fraands. With such profound Gyan, Jerk #2 becomes a #Baba and move ahead towards world peace! In this entire Crapola (which lasts for unapologetic 155 minutes), those 20 minutes of Aishwarya Rai is like a whiff of fresh air. Her role is a blessing in disguise which prevents audience from asphyxiation. I never believed I would ever write this but I loved Aishwarya and every bit of it. Only character in the film who is crystal clear about her intentions and plays it perfectly. Be it her sensual appeal, catchy dialogues, confident demeanor or facial expressions. I don't think anyone could have played it better than her. Absolutely marvelous! For others, I would say it is a shame to be a part of this film which would go down in the history as one of the costly disgraceful film with negative ROI. In terms of music, Bulleya and Channa Mereya are beautiful songs. Others are just average. It disheartens me that KJo managed to get excellent ratings from all renowned critics - Rajeev Masand 3.5/5. Raja Sen 4/5. Nihit (TOI) 3.5/5. If you think, I am biased then how would you justify 5.5/10 on IMDB with 2700+ votes. Verdict: If you had to choose between ADHM and Krishi Darshan on DD1, better learn some skills to identify good quality Sona Masoori rice. Just having Mr Perfect in the film doesn't guarantee its entertainment quotient.That is what I feel after watching the trailer of Dangal. Plot looks extremely predictable. Aamir Khan doesn't look convincing as a Haryanvi wrestler. He didn't get the diction right. Director Nitesh Tiwari doesn't have any major success yet. A lot depends on Fatima Sana Shaikh (who has given 5 mega flops in a row and whom no one knows yet) and debutante Sanya Malhotra. Only ray of hope is due diligence and business acumen of Aamir Khan. Mr Perfect doesn't touch anything unless it has superlative content and quality. Let's hope he is able to maintain his track record. Wishing Dangal all the best! Making a biopic is always challenging and especially when you are making on someone who is just 35 years old. Story of Dhoni is like an open book. What possibly can one show in 190 minutes in an entertaining way and keep audience engaged? You have to watch the film to appreciate the Midas touch of a marvel called Neeraj Pandey. How could one possibly imagine that captain cool with nerves of steel had a phase in life when he was dull, depressed and unsure of his cricketing future? How many of us know that he too had a love story, a beautiful tragic one. Still that didn't affect his game and dedication towards his passion. That's why he is worthy of a biopic, that too an inspiring one. Neeraj Pandey (the man behind story, screenplay, dialogues and direction) is undoubtedly the all rounder of Bollywood. This is his 4th film as a director after A Wednesday, Special 26 and Baby. How can one not be floored by his consistent performance of giving critically acclaimed blockbusters back to back. He ensured that he lives up to audience expectation in this film too. Film runs at a fast pace with lots of action happening everywhere. Yet director ensured that there aren't any half baked characters and enough time was spent on Dhoni's initial struggle in Ranchi to his frustration in Kharagpur and then his journey to stardom. Sushant Singh Rajput has finally delivered a film, which would be remembered for his acting prowess. Cricket fans would vouch for him transforming into Dhoni. Be it his gait, mannerism, facial expressions, nose twitch, helicopter shot or entry into the ground. Absolutely brilliant! There is a scene when he receives a bad news over phone and had to express anguish without any dialogue. Clap worthy performance. I am glad he didn't dance in any of the songs despite being a good dancer. Disha Patani plays the role of Dhoni's girlfriend. She looks attractive and does justice to role given to her. Somehow her line of "Hamare paas bahut time hai na" was way too forced and artificial. How could Neeraj Pandey not have noticed it? Kiara Advani as Sakshi Dhoni was below average. But, I liked the scene where she goes to meet Dhoni with her friend and had to almost keep her star struck friend on leash. Anupam Kher as Dhoni's father and Bhoomika Chawla as her sister gave a forgetful performance. Kumud Mishra as Railway officer was impressive in his grey character. Director chose to leave his intentions ambiguous and up to audience interpretation, which I liked. Other than Sushant Singh, Rajesh Sharma as Dhoni's coach is another character worth applauding. You would love his scenes at Sabji mandi where he gets restless to go for cricket practice. Rajesh Sharma makes even a dull scene of watching cricket match so lively having friendly banter with his wife. There were many unnamed characters with small roles yet important enough to give a shape to story. For e.g. Sports shop owner Sardarji who believed in Dhoni from Day 1. His school friends who were there for him through out his struggle. Mr AK Ganguly who gave him the break in Railways and made him realize that this is not his destiny. 2 cricket commentators, who saw every match of Dhoni from school days to India Captain. You will even recognize characters playing Yuvraj Singh, Dalmiya, Sandeep Patil, Kiran More, Vengsarkar etc. Film also had highlights of Dhoni's crucial matches and how each of them solidified his performance in the team. Thankfully, songs didn't act as a drag and helped story to move forward. Verdict: Overall a well made film, which would get nominated in awards this year for direction and story. Even if you don't love cricket you should still see the film to see struggle of a man who believed in himself and chased his passion till eternity. 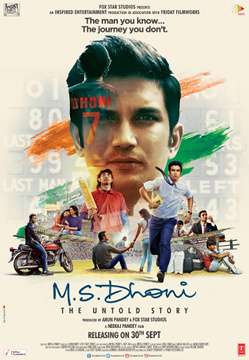 After watching the film, your respect for Dhoni would go up 2 notches higher.